They are demanding that the funds be spent on resources like schools, clinics, and housing. EDITOR’S NOTE: This article is part of The Nation’s Take Action program, which we use to point our readers toward actions they can take on the issues we cover. To get actions like this in your inbox every Tuesday, sign up for Take Action Now. 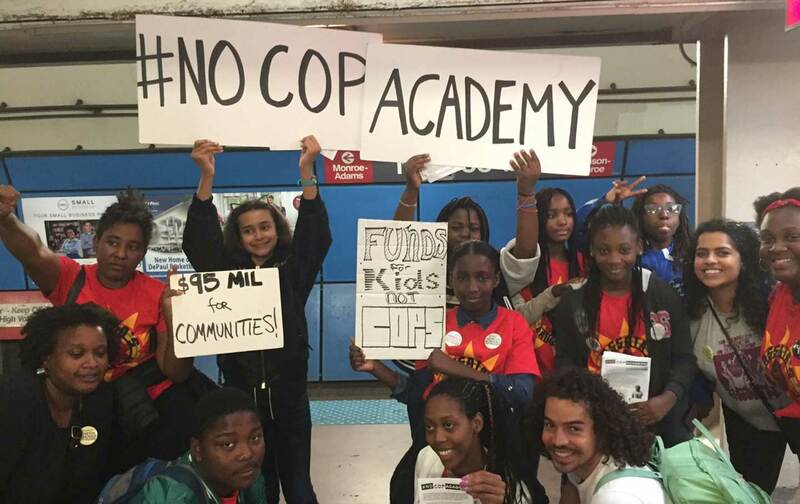 Sign the petition to join over 25 Chicago-area and national organizations in supporting the #NoCopAcademy campaign to demand that $95 million be redirected into vital community infrastructure rather than expanding the Chicago Police Department. Over the 4th of July weekend this year, Chicago Mayor Rahm Emanuel announced plans to build a $95 million police- and fire-training academy in a predominantly black community on Chicago’s West Side. Emanuel claims that the center is needed to move forward with reforms after a Department of Justice report in 2017 confirmed what members of the community had been claiming for decades: that the CPD engaged in rampant discrimination, violence, and abuse against black and brown communities. Activists working in the communities victimized by the CPD say that the project does nothing to address the lack of accountability for the department’s endemic racism and violence. They point out that the overarching demand of the DOJ report, and community activists working to end police violence for years, has been for meaningful police accountability, something that they say pouring $95 million into a new training center fails to address. Furthermore, while some have praised the project as a “development opportunity” for the neighborhood, much-needed resources in that same community are being cut. When Emanuel famously closed 50 schools back in 2013, six of them were located in the same neighborhood as the proposed police-training center. The plan is just the latest version of ongoing divestment from communities of color alongside massive resourcing of police infrastructure. Chicago already spends $1.5 billion on police every year (that doesn’t include the hundreds of millions of dollars the department has paid out in misconduct settlements). That’s $4 million every single day, and more than the city spends on the Departments of Public Health, Family and Support Services, Transportation, and Planning and Development (which handles affordable housing) combined. Mental-health spending receives $10 million per year, and only $2 million per year is allocated to violence-prevention services. Just this year, Chicago Public Schools laid off another 950 employees, while CPD is in the process of hiring 1000 additional police officers. Activists say that the message Mayor Emanuel is sending is clear: He supports schools and resources for cops, not for black and brown kids. Join the War Resisters League, Assata’s Daughters, People’s Response Team, and For the People Artists’ Collective in calling on the Chicago City Council to reject the “Cop Academy” and instead direct those resources to schools, clinics and housing. To the City Council of Chicago: We urge you to freeze the plan to spend $95 million on new training grounds for Chicago Police and Fire. Explore other options that don’t involve expensive construction, and redirect that money towards community needs. Vote NO when Rahm requests approval to spend $9.6 million on the land purchase at 4301 W. Chicago Ave from the full City Council! You will receive activism alerts and updates from The Nation magazine and the War Resisters League. You may unsubscribe at any time. The problem of police violence in Chicago has been documented for years by black organizers and was exposed for people across the country by the scathing 2017 Department of Justice report. While change is needed, long-term community activists see Emanuel’s claims about the training center as an insult to those who’ve experienced police violence first-hand and have continually demanded accountability, not expansion. Rather than committing to meaningful community control of the police, they see the attempted facelift as aiming to quell dissent and expanding CPD’s capacity to target, harass, criminalize, taze, stop, frisk, and incarcerate black and brown communities. And while the city wants to push the idea of joint training for police and fire, activists say that more collaboration at the level of training will lead to increased militarization of emergency responses across the board, which has already had dangerous results. For example, since 2013, Chicago police have deployed SWAT teams at least 38 times to respond to mental health incidents and suicide attempts, according to deployment logs obtained through a Freedom of Information Act request. Chicago has a strong tradition of organizing against police violence, from We Charge Genocide, the historic youth-led delegation to the United Nations, to winning Reparations for Survivors of Jon Burge torture; shutting down the International Association of Chiefs of Police Conference to ousting racist State’s Attorney Anita Alvarez. While organizers want change, spending $95 million to construct massive new training grounds was never an ask of communities organizing against Chicago police violence. Rather, they have consistently demanded that Chicago defund the police and re-invest those dollars in community needs. While Emanuel is trying to capitalize politically by posing as resistant to Trump’s policies, this recent move aligns him with Trump when it comes to law enforcement and militarism. In the context of rising police and military budgets across the country, we need a shift in priorities towards funding for our communities across the country. That’s why, as part of the movement against police violence and militarism around the country, Chicago activists are calling on Chicago City Council members to reject Mayor Emanuel’s plan and commit to investing $95 million in marginalized communities instead.